Any information about the match Zimbabwe v Zambia ? Scorers or report available ? getienne wrote: Any information about the match Zimbabwe v Zambia ? in addition to the article already reported by Neptune in this forum, in "General topic for African Rugby". the highest ranking team always hosts the lower ranking team in the Gold Cup. This was a case of pure favouritism by Rugby Afrique. Now im reading a very interesting book. 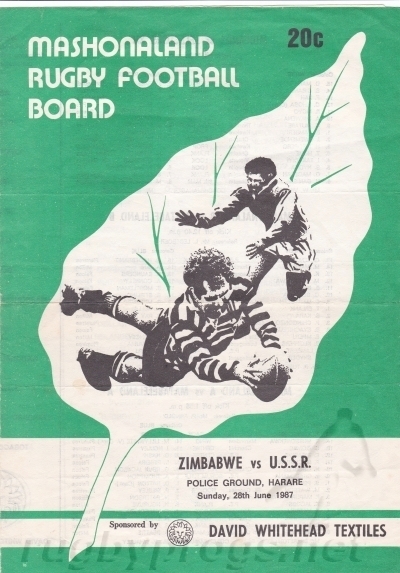 "Rhodesia rugby" by Jonty Winch. Livestream of the Zim Senegal game. Sables 4 EVA you didn't answer my question , Where are the Sables regular starters in Jacques Leitao, Tafadza chitokwindo, Sibanda, Tichafara Makwanya and Andrew Rose? Not forgetting 2nd row Conor Pritchard? Neptune wrote: Sables 4 EVA you didn't answer my question , Where are the Sables regular starters in Jacques Leitao, Tafadza chitokwindo, Sibanda, Tichafara Makwanya and Andrew Rose? Not forgetting 2nd row Conor Pritchard? Jacques, didn't make the trip, Chitokwindo wasn't selected, Sibanda? T-MAk and Connor played and Andrew Rose is in the USA and was unavailable. There is a new President in Zimbabwe in government and in the ZRU. There is a huge swelling of optimism in the country over the possible improvement of the economy and this will help rugby in general. The new ZRU presidium met with clubs in Harare last weekend and has made some assurances and promises for the state of the game. Skeptics will say the previous disgraced board said the same thing a year ago but nothing came of it so only time will tell. Aaron Jani is visiting all the other provinces this week to spread his message. One thing he emphasised was that clubs need to run more professionally and will be held accountable for transgressions. Some big names have been thrown about to take over the Sables, Colin Osbourne is coming for a coaching visit from Harlequins in the UK so the thought is he may be in line for the role. Other names mentioned are John Mitchell and Peter De Villiers. With the Namibia game being played in Zimbabwe, the foreign contingent being approached seriously and the establishment of an independent Sables Trust to run the national team there is a growing hope that we are finally going in the right direction. Personally I feel the away game to Kenya is the hurdle we need to focus on, though all games in the Rugby Africa Gold Cup are tough now. The schedule for the Sables is rumoured to include at least 3 warm up games, opponents yet to be announced but most likely to be SA provincial sides and is only likely to be released once the coach has been announced. The Cheetahs are pushing to improve in preparation for the World cup and the Hong Kong 7s. There has been an extensive program set up of training camps and competitions to hone the team before taking on the world. The season has kicked off with the traditional U21 club games being held in Bulawayo with 4 teams. The Northern half of Zimbabwe will kick off their games on the 3rd of Feb with 14 teams. There is a possibility that Kwese will be covering the Harare competition, links to follow if that happens. Good to hear this, hopefully we will see more than talks soon. Africa needs some competition for Namibia. Any clue about players from abroad who are likely to be called to Sables ? There have not been any names mentioned but apparently there have been a lot of players in Europe and SA who have been contacted. Sables, do you know if there is any reasonable explanation why so many Zimbabwean players are coming to Spain recently? We had Jan Ferreira in Burgos and Royal Mwale in Almería in previous seasons and in the last couple of months we've seen the arrival of Fortunate Chipendu (La Vila), Gabriel Sipapate (CAR Cáceres) and Matthew Mandioma (Liceo Francés). We have had a few players join the German and Romanian leagues too. I think it i just a stepping stone to full professional status. Also the amount of rugby played in Zimbabwe is probably not enough for them to build up decen portfolios. Sables4EVA wrote: We have had a few players join the German and Romanian leagues too. I think it i just a stepping stone to full professional status. Also the amount of rugby played in Zimbabwe is probably not enough for them to build up decen portfolios. The Bulawayo U21 competition continued last weekend with the last group matches. Still no news on who will be set as the next national team coach, the ZRU have been conducting interviews all week and the announcement will be made in the near future hopefully. Semi finals were played yesterday for the Bulawayo U21 competition. Final to be played next weekend. Former Springbok coach Peter de Villiers has been unveiled as the new head coach of the Zimbabwe national team. I think is a great thing for Zimbabwean rugby, I really liked PdV as coach of Springboks as well and shall they settle with players who play abroad and have some decent funding I think Zimbabwe will challenge WC qualification with much more success! Best of luck Peter de Villiers! Probably you are the only one who liked him as Boks coach ). In hindsight he wasn't so bad since standards in SA have continued to fall. He also replaced a RWC winning coach in Jake White. But he's a big name for Zimbabwe, can hopefully help to attract some of the overseas contingent or unearth some new eligible players in SA. PdV wasn't all bad. He was happy to call out SARU's crap when he saw it, and tried to bring a more expansive game plan to the Boks, something Coetzee was never going to be able to do. The rugby community here is very excited about this development, already there have been interest from overseas players who want to be a part of the new direction the country is going. I don't rate him as a coach at all. But if he galvanises positivity in the game in Zim, then thats awesome.